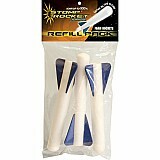 These are the original stomp rockets! At Becky & Me Toys, we think they're also the best stomp rockets out there. © 2019 Specialty Toys Network, © 2019 Becky & Me Toys or its affiliates. All Rights Reserved.